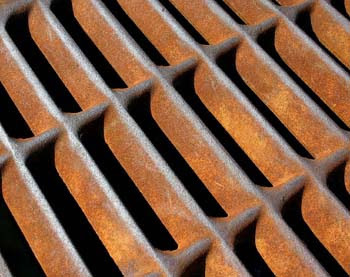 Real Life LEED: Walk Off Mats and Grates - In or Out? Short Answer: Inside Medium Answer: Inside the building, but it can be outside if it's "protected from the weather" Long, Rambling Answer in Story Form Including a Few Rants: We were working on a high end project and I brought up the fact that we need walk-off grates at all entrances that are at least six feet in the main direction of travel. Sounds simple enough but then there was a question: "Do the grates need to be inside or outside the door?" Since the point is to keep dirt and debris from entering the building, I came to the logical conclusion that the grates we need to be on the outside. The credit itself calls you to "Employ permanent entryway systems... to capture dirt and particulates from entering the building at entryways that are directly connected to the outdoors." If you've placed a grate or grill inside the building you've already lost the battle right? By having it outside the door, the grates allow dirt to drop to the bottom, and when it rains some of the dirt could be washed away. Also, people will be stomping their feet, a process that is certain to kick up dust indoors. I was pretty certain, but I wasn't 100% sure so I decided to check the reference guide. Why I'm Annoyed with Flexibility Those of you used to searching for practical, detailed information within the reference guide can probably guess where this is heading... The reference guide frequently stops at the level of giving practical advice like this. I understand the reasoning. By keeping things vague you allow for unforseen circumstances to be dealt with in a case by case basis. In theory it allows costs to be controlled, but in practice it's annoying. On the plus side, at least I have stuff to blog about. Credit Interpretation Requests (aka CI Rulings) If you haven't been initiated yet, the place where the answers are is within the CIRs... This is your answer depot. Luckily, someone else had the same question (note: you must work for a USGBC member company or be listed as a team member on a LEED registered project to havea access to the preceding link) and submitted it for a CIR. In fact two people did within eight days of each other... Scroll down to the ruling on 11/01/2004: "The intent of EQc5 is to prevent contaminants from entering the building which could have an effect on the indoor air quality. However, the location of the 'permanent entryway system', for example grills and grates, is subjective, depending on the layout of the building. If there is a vestibule it may be appropriate to have a walk off area located within it. Also, exterior walk-off areas may be considered if the area is protected from weather. Alternatively, the walk-off area can be within the building." How's that for a definitive answer??? My interpretation of this interpretation is that you always go inside unless you have a covered area (i.e. rain can't get on it). As we're largely talking about metal grates and grills, I don't buy the argument that they could "get wet and muddy", but c'est la vie. I understand that the entryway systems need to be provided at the entrances from the covered parking garage. For a non-residential building with the 2 levels of underground parking, does it necessary to provide the entryway system at the lift lobby at the basement parking? Any advice would be much appreciated. Many thanks! Do walk off mats if located indoors have to be low VOC (ie follow the req of EQ 4.3)?